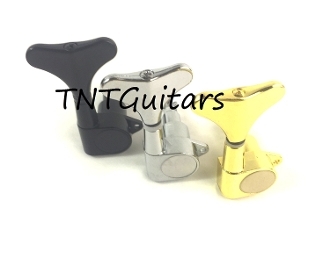 These Bass Tuners are enclosed-gear, threaded hex bushing, split shaft, modern sealed style guitar tuning keys for Jazz/J Bass, P/Precision Bass, or PJ/Precision Jazz Bass Guitars. Be sure to check your measurements carefully to see if these tuning pegs will work for your set-up. If you have a right-handed bass, select a right style tuner. If you have a left-handed bass or reverse headstock, select a left style tuner. If you have a 2x2 set-up, select the appropriate style for your needs. Contact us with any questions prior to purchase. Measurements provided are approximations; variability is to be expected. Ask any questions prior to purchase. Nothing else is included. Additional images may be provided for reference and comparison purposes only. Buyers assume all risk of use; sales are only offered to those competent to safely and lawfully purchase and use items. INSTRUCTIONS FOR INSTALLATION ARE NOT INCLUDED. Depending on your current set-up, installation may require extra care and accuracy. Lubrication of screw threads may be helpful (cutting lube, wax, or bar soap) to reduce friction and help with proper thread. Note that we do not recommend installation using power tools as these can put too much force on the product and cause damage. We do not provide technical or any other type of support for installation, configuration, modification, or use of this item. Do not purchase if you are unsure of your ability to successfully complete installation. ALLOW & EXPECT variation in color due to photo and monitor settings as well as natural product variance. Color descriptions indicate color only, not material. Due to the production/machining process, some natural variation and imperfection may be expected in the finish of this item. Product may have a mirror style finish; this finish may reflect your individual environment and impact overall appearance. CONTACT US PRIOR TO PURCHASE if you have any questions or concerns regarding color, pattern, fit, materials, installation requirements, compatibility with your instrument, measurements provided, or anything else.